Highest quality inground pools and service in HRM for 35 years. 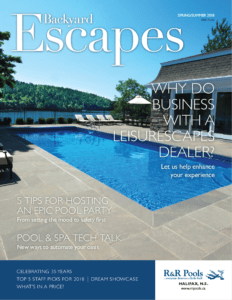 Backyard Escapes 2018: Why do Business with a Leisurescapes Dealer? Our 2018 annual swimming pool, hot tub and backyard magazine with trends, advice, beautiful backyards and all the details you need to make this summer the best. We specialize in In-ground pools, and we are proud to be the best at what we do. From simple to complex projects we know pools! We offer a selection of models to choose from to fit any budget and to enhance any backyard setting. Whether you are looking for someone to install your pool, fix your pool, or answer questions you may have, you have found the right place for service.